On the maps of Ukraine in the 1980's it was marked implausibly as a Young Pioneer camp. In reality the Duga, a mass of interwoven pipes, pylons,and wires, was a top secret experimental Soviet radar installation hidden away in the Chernobyl Exclusion Zone. 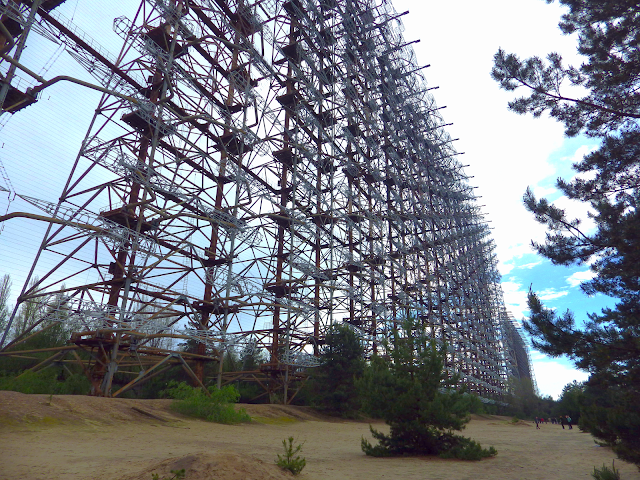 Rising to over 150 metres in height, and over 500 metres in width, the radar dominated the forests around Chernobyl. Although officially secret, its size somewhat gave it away, and the spy agencies and NATO knew of its existence. It was also known to all those who watched TV or listened to the radio across Europe. The powerful radar emitted a constant chirping sound, similar to a woodpecker, which would disrupt television and radio broadcasts and even interfere with emergency frequencies used by aircraft. Such was the signal disruption that radios and televisions had to be re-designed to block the interference caused by the Duga, and its two sister radars, one nearby in northern Ukraine, and the other close to the border with China in the eastern part of the Soviet Union. The Duga in the Chernobyl exclusion zone is the last of the three still standing, and as I wandered around it was clear this was not going to be the case for very much longer. Concrete foundations have started to rot away, and large bits of metal have fallen to the ground in a number of places. A significant storm could wreak much damage, and with it out of commission for 25 years, and of no use these days to Ukraine, it is unlikely that money will be found for any restoration work. The array was extremely powerful; it could easily identify missile launches from western Europe. It also required a lot of electricity, this was also one of the reasons it was located close to Chernobyl, as it consumed up to 40% of the power plants total energy production. The loss of reactor number four in 1986 did not kill off the Duga, as the other reactors at Chernobyl kept on providing electricity. 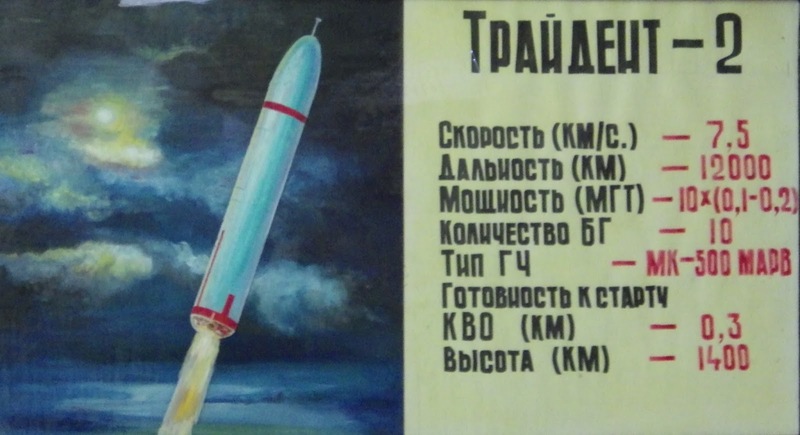 It was the ending of the Cold War that proved to be the death knell, alongside new technology, in the use of advanced Soviet satellites which could perform the same role at significantly less cost. Behind the radar are abandoned offices and the administration blocks. Most have been stripped off their equipment, but there are a few remnants of the time when the Duga was at the forefront of the ring of Soviet missile defence bases. A training room on the second floor has posters of Trident and Cruise missiles with technical and speed information, so that personnel could more easily identify which types of missile were being launched. Along the corridor is a canteen, where large propaganda posters show US Marines tormenting a Russian mother and child, alongside a photograph of a Texan wearing a ten gallon hat with an evil grin on his face. The Duga would make for a great museum, although the high levels of radioactivity present here, along with the astronomical costs required to prevent the radar array from collapsing, make this unlikely. It remains, at least for the time being, as a monument to the ingenuity of the Soviet military during the Cold War.